Namibia’s harsh dry environment may not seem like the ideal habitat for large browsing mammals but surprisingly, these animals thrive under such conditions, and the country is home to not one but two types of giraffe. Apart from the well-known South African giraffe, which is found all over Southern Africa, the Angolan giraffe subspecies, Giraffa Camelopardalis angolensis, also known as the Namibian giraffe, is found in northern Namibia. A 2009 genetic survey even suggests that the giraffes of Etosha National Park form a third, unnamed subspecies. The Angolan Giraffe is different from the more common South African giraffe in that it has a white ear patch and more staggered edges to its blotches. While a giraffe’s most famous feature is its elegant neck, they also have some handy characteristics which enable them to survive in extremely harsh conditions. They can go without water for many weeks and can close their nostrils completely to keep out the dust from their harsh environment. This would suggest, as does their Latin name, that they are related to camels, but their next of kin is in fact the jungle dwelling okapi. Giraffe browse mainly on acacia leaves, twigs and fruit and they are instrumental in the lifecycle of these trees. As they feed, the giraffes’ whiskers pick up pollen from the acacia blossoms and transfer it to neighbouring trees when they move on. Despite their long necks, giraffes also habituate grass plains, although they feed mainly on the outskirts of these grassy patches. In Etosha, the Acacia nebrownii thickets on the edge of the plains are all the same height as a result of the giraffes’ feeding activities, and the Acacia reficiens trees on the road between Namutoni and Klein Namutoni have all been browsed flat on top. 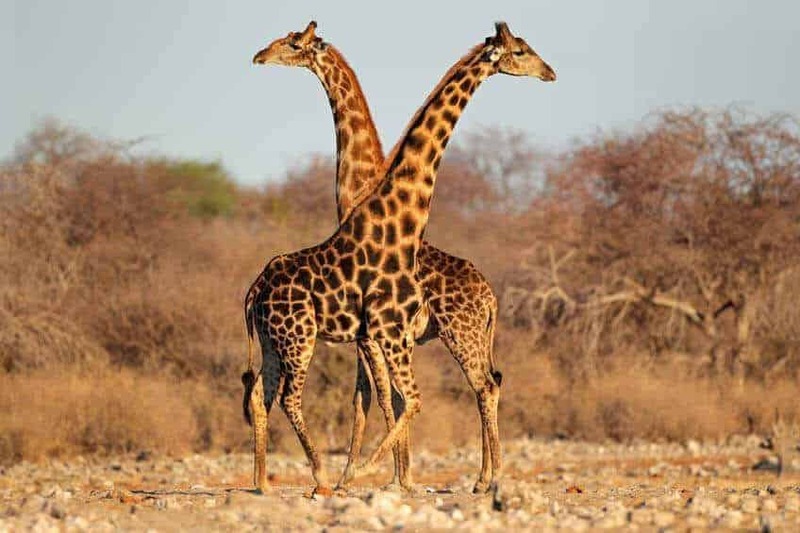 If you would like to find out where the giraffes are hanging out on your next trip to Namibia, head to Etosha National Park, any of the private game reserves, or Damaraland and Kaokoland where there are still wild free-roaming populations.